Hunting for comparisons, the Monteverdi Choir/Gardiner recording on Soli Deo Gloria (see review) has a similarly lively vibe but is a drier recording and rather choir-heavy, with enough sibilance to sail a small ship. The fuller instrumental sound with this Proprius recording means you hear more texture in the accompaniment, where with Gardiner you get the bass line but not a huge amount of anything else. 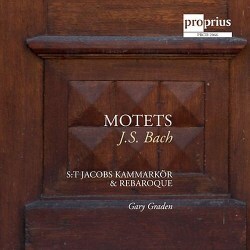 Masaaki Suzuki and his Bach Collegium Japan on BIS (see review) is always an enticing prospect, and in sonority comes closer than Gardiner to the fullness of Gary Graden’s team, though on returning to this recording you do wonder if the buzz-saw lead violin might perhaps have been a little lower in the balance. My feeling with Suzuki is that the motets are treated as jewels which are perhaps just a little too precious, and my liking for the Graden recording comes in large part from the energy and spacious generosity which leaps palpably from your speakers. I’ll go for one more comparison, which is the Collegium Vocale Gent led by Philippe Herreweghe (see review). This is very much the tidied-up single voice to a part kind of interpretation to which many will have become accustomed in recent years, a single organ sometimes providing all of the harmonic support required, the contrast between this and the motets which include winds and strings making for an attractive sequence. There is much to be said for the clean sound of such versions, and a little more variation in instrumental forces in the Proprius version might not have come amiss, though the strings are silenced in Ich lasse Dich nicht, du segnest mich den, pungent bassoons doing the honours amongst some sublime choral polyphony.